Phillip obtained his B.S. degree in Chemical Engineering at the University of Tulsa. 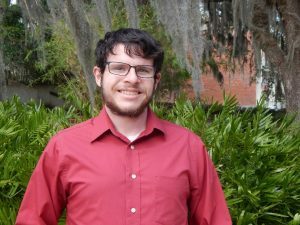 His undergraduate research focused on the characterization of self-healing polymers. At the University of Florida, Phillip researches under Dr. Anuj Chauhan, specializing in the design of ophthalmic drug delivery systems in the form of contact lenses and eye drop bottles. 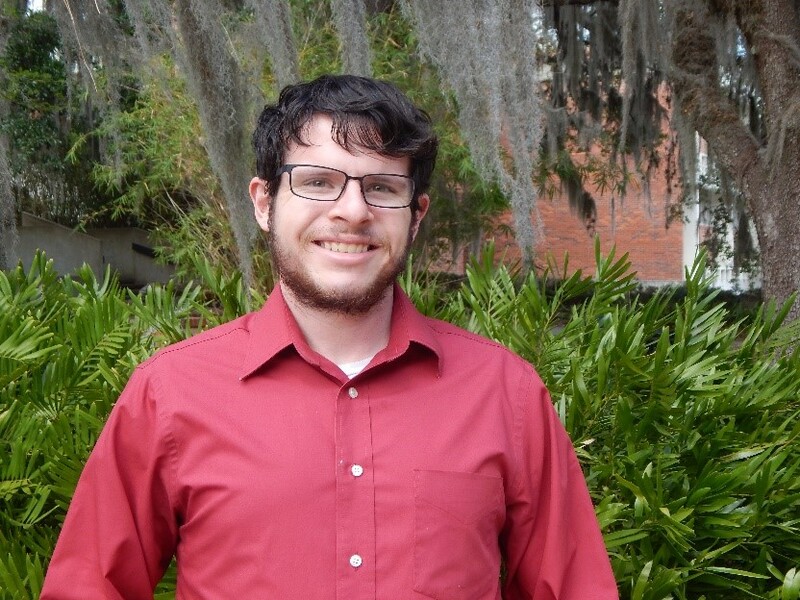 Phillip’s research interests include polymers, biomaterials, pharmaceuticals, and applied transport. Abstract: Cystinosis is an orphan disease caused by a genetic mutation that leads to deposition of cystine crystals in many organs including cornea. Ophthalmic manifestation of the disease can be treated with hourly instillation of cysteamine eye drops. The hourly eye drop instillation is tedious to the patients leading to poor compliance and additionally, significant degradation of the drug occurs within one week of opening the bottle, which further complicates this delivery approach. Our work focuses on designing a contact lens to treat the disease with improved efficacy compared to eye drops. Our goal is to design a lens that is safe and that can deliver a daily therapeutic dose of cysteamine to the cornea while retaining drug stability. We show that cysteamine diffuses out rapidly from all lenses due to its small size. The rapid release of cysteamine and other ophthalmic drugs can be prolonged significantly by integration of vitamin E aggregates inside of the polymer matrix of silicone hydrogels. The increase in release duration increases as square of the volume fraction of the loaded vitamin E fraction which leads to high efficacy and suggests that the mechanism of attenuation in drug release is formation of nanosized barriers. The increase in duration depends on the type of the contact lens. 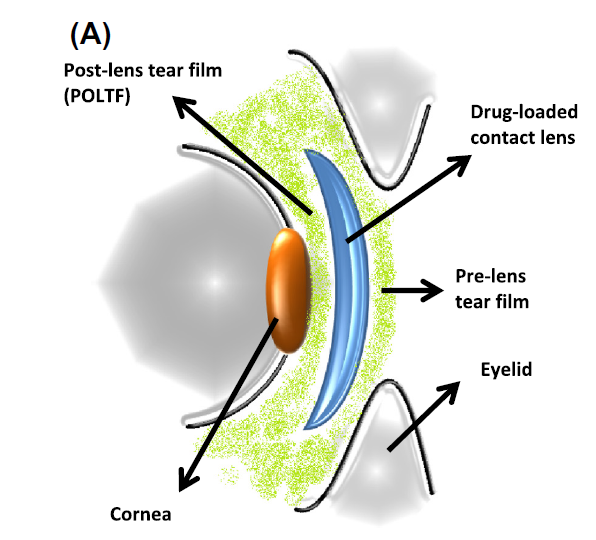 The barriers are not effective in single-phase hydrogel lenses while the effect in the bi-phasic silicone hydrogels depends on the type of the contact lens. 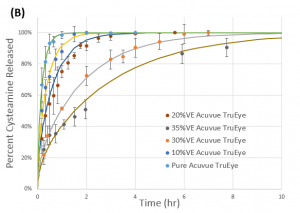 Vitamin E incorporation increases the release duration of both ACUVUE®OASYS® and ACUVUE® TruEyeTM but the effect is more pronounced in TruEyeTM likely due to the low solubility of vitamin E in the lens matrix and higher aspect ratio of the barriers. This result along with the high aspect ratio seen through SEM imaging in silicone hydrogels suggests that barriers could be forming at the interface of the silicone and hydrogel phases. The presence of vitamin E has an additional beneficial effect of reduction in the oxidation rates, likely due to a transport barrier between the oxygen diffusing through the silicone channels and drug located in the hydrogel phase. 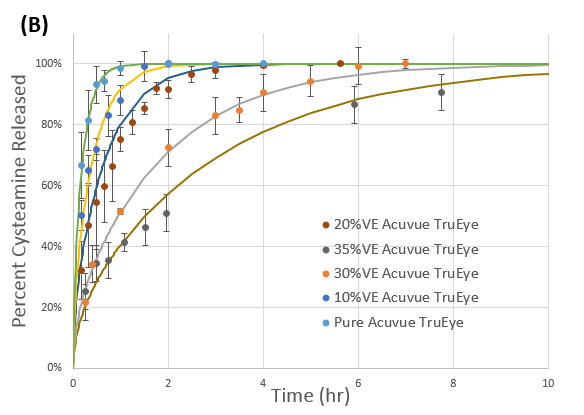 Based on this study, both Acuvue®OASYS® and ACUVUE® TruEyeTM can be loaded with vitamin E to design a cysteamine eluting contact lenses for effective therapy of cystinosis. The lenses must be worn for about 4-5 hr. each day, which is less than the typical duration of daily-wear. Vitamin E loaded contact lenses could be very useful for treating many other ophthalmic diseases as well.